Many people come to this part of Java not only to marvel at the Borobudur Temple attractions, but also to pay a visit to the neighbouring Hindu temples at Prambanan, which by road are no more than an hour away, and conveniently almost next door to the Kraton Ratu Boko (Ratu Boko's Palace). 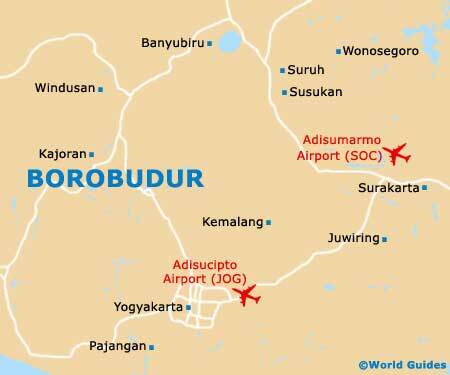 Lots of further day trips are quite possible from the Borobudur area, with the cities of Semarang, Solo (Surakarta) and Yogyakarta all being relatively close by and feature enough tourist attractions to fill an entire holiday, and more besides. Standing at just under 2,100 metres / 6,890 feet above sea level and around 102 km / 63 miles to the north-west of Borobudur, the somewhat elevated Dieng Plateau contains some of the most historical Hindu temples and related attractions residing on the island of Java. Close to Borobudur, Solo and Yogyakarta, the Prambanan temples are very appealing and easily reached by bus. Built during the middle of the 9th century and covering a large expanse, the Prambanan complex really is quite impressive and is made up of over 250 temples, which stand in different states of repair. Although the origins of this attraction are a little vague, the largest Prambanan temple is known to have been dedicated to the Supreme God Shiva and boasts a spire that measures just under 50 metres / 164 feet in height. At one stage in excess of 400 beautiful temples graced the landscape of the Dieng Plateau, being built during both the 8th century and the 9th century. When Central Java's population dramatically reduced some centuries later, the temples were forgotten about and only discovered as recently as the middle of the 19th century, when an archaeologist drained the valley. Today there are a total of eight temples still standing on the Dieng Plateau, being typically Javanese and box-like in their appearance. Semarang is a busy port city and resides on the northerly shoreline of Central Java, where it is approximately 94 km / 58 miles to the north of Borobudur. Serving as the proud provincial capital of the Central Java region, Semarang is known for its plentiful colonial architecture and rather lively Arab and Chinese neighbourhoods. The main attractions in Semarang can be found within the Old City (Outstadt) area and include the Gereja Blenduk Church, the Tay Kak Sie Temple and the Chinese Market (Pasar Cina). Also of note is the outlying Sam Po Kong Temple (Gedung Batu) and the 'jamu' (herbal medicine) museums. A relaxed city steeped in tradition, Solo is to be found some 90 km / 56 miles to the east of Borobudur and also goes by the name of Surakarta. Solo is very much based around its central thoroughfare of the Jalan Slameyt Riyadi, around which you will find a wealth of hotels and eateries. When it comes to attractions, Solo's crowning glory is its beautiful 18th-century palace, the Kraton Surakarta, while the Puri Mangkunegaran is another palace of great standing. For museum buffs in Solo, both the Radya Pustaka Museum and the Danar Hadi are particular highlights. Being only just over 40 km / 25 miles away from Borobudur and to the south-east, Yogyakarta is one day trip that should be added to any holiday itinerary. Yogyakarta is often considered to be the soul of Java and although it has become a little touristy in recent years, its appeal is undeniable. Attractions in Yogyakarta come thick and fast, and include the palace of the sultans (Kraton), which dominates the heart of the historical old city and is surrounded by a long stone wall. On the westerly side of the Kraton, the Taman Sari (Water Castle) is a stunning park, with palaces, large pools and landscaped gardens. Generally considered to be the gateway into the Dieng Plateau, Wonosobo is located around 79 km / 49 miles to the north-west of Borobudur and lies within the central mountain range. Wonosobo is a medium-sized town with a definitely rural feel, featuring a busy market and some very affordable homestays. During national public holidays in Indonesia, Wonosobo really does spring to life and villagers from all around congregate in the main plaza, to join in with the festivities and enjoy the entertainment provided, such as Kuda Kepang dancing from Temanggung.